We will do Guru Pujas (Lama Chöpa) with Tsog for the long life of Lama Zopa Rinpoche. All FPMT centers worldwide participate in this practice, with a goal to perform 100,000 tsog offerings. Our center will perform 1000 tsog offerings, i.e., offering verses in the Lama Chopa Jorcho. This year seems especially important for all Rinpoche’s students to come together in some way to offer practice and prayers for Rinpoche’s long and healthy life. 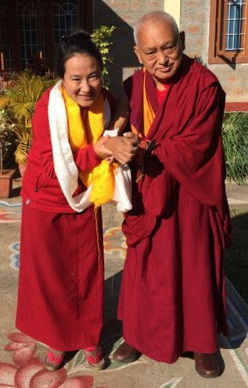 When I asked Khadro-la for her observation, Khadro-la answered with a deep concern and wish that all the students in all the centers, projects and services come together in some way and offer a long life puja to Rinpoche, as well as perform 100,000 tsog offerings. Lama Zopa Rinpoche with Khadro-la (Rangjung Neljorma Khadro Namsel Drolma), South India, January 2016. Photo by Ven. Roger Kunsang.